A friend and I were talking the other day about if we would ever be brave enough to sleep over night in a haunted house. Her answer was a definite NO. Mine was a maybe….I’m open to the idea. While it might be hard for me to find a haunted house since I can’t just show up at someone’s place and ask to stay over. That would be a little awkward. I can, however, find a haunted hotel. That is totally doable. Our conversation got my wheels turning as I was trying to think of the haunted places in Canada that I’d heard of before. I figured it would be a fun and timely post with Halloween coming up soon. I’ve been to two of the places mentioned: Buck Hill Road and Peggy’s Cove, NS. I didn’t notice anything at Peggy’s Cove when I was there, but Buck Hill Road? Yup, it’s pretty creepy. Let’s just say I’m never going back. The last time I was there I was so freaked out. I’ll save that for another blog post. I need to work up the nerve to tell what happened! 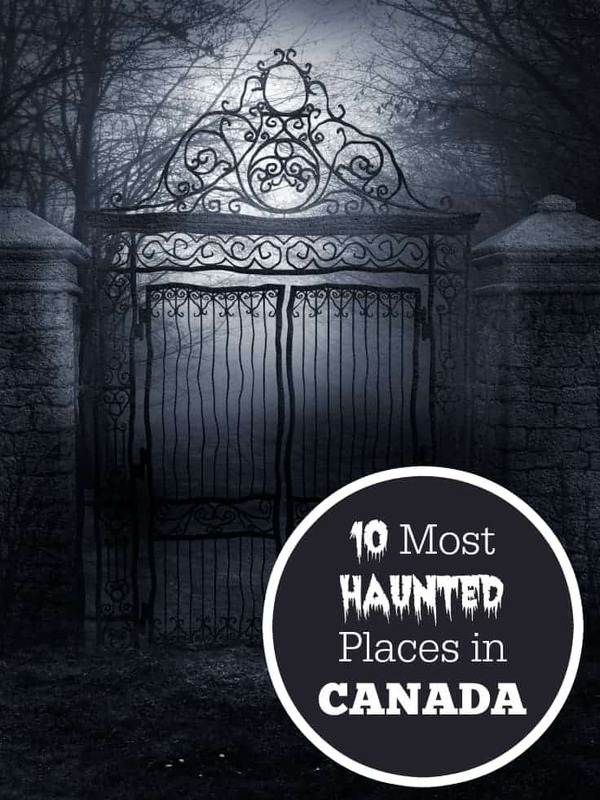 If you’re looking for a scare in Canada, look no further than this list! 1. Buck Hill Road (Ottawa Valley). Legend has it, a logger went to search for his missing child, but was unable to find her. The family lived on Buck Hill Road, and they searched up and down to no avail. Up until his death, the logger would comb the area nightly with his lantern. Some locals believe his search continues to this day. 2. Banff Springs Hotel. A bride walking down a candle-filled staircase on her wedding day, her dress caught fire. She stumbled down the stairs, breaking her neck. She’s still said to be wandering through the halls in her wedding dress. 3. Queen’s Park (Toronto). Once upon a time, Queen’s Park belonged to a psychiatric hospital. Three former inmates roam the current building, though they’re not the only spirits known to haunt the place! 4. Peggy’s Cove, Nova Scotia. In the 1800’s, a woman named Margaret watched her new husband slip on the rocks in front of the lighthouse, suffering a fatal head injury. Shortly after, she killed herself. Folks have said they see the woman, wearing a blue dress, about to jump into the sea. 5. The Blue Ghost Tunnel (Thorold). Unexplained noises and demonic energy welcome you to the Blue Ghost Tunnel in Thorold, Ontario. Men were killed during the building of the Welland Canal and are known to haunt the tunnel. 6. Hotel Fairmont (Vancouver). The Lady in Red was a regular of the hotel back in the 1940s. After she passed away, she stuck around the hotel, and is seen passing through elevator doors. 7. The Haunted Walk (Kingston). Take a Trolley Tour while you visit Kingston, Ontario. Known to have converted even the biggest of skeptics, this one is the real deal. You’ll hear many stories, such as the horrors of Kingston Penitentiary, and even the maiden ghost of Cedar Island. 8. HI-Ottawa Jail (Ottawa). Once a jail, now a hostel, guests regularly report seeing and hearing activity from past prisoners. 9. Lester B Pearson Elementary School (Saskatoon). There is a tree located in front of the school, that’s said to have an incredible power attached to it. They say if you sit near it for 2 minutes when you’re alone, you’ll be paralyzed momentarily! 10. Montmorency Falls, Quebec . Here, you’ll see a Lady in White wearing a wedding dress, through the mist of the falls. According to legend, she was engaged to a soldier who died in battle in 1759. She went out every night and called his name, but he never came back. She put her wedding dress on and threw herself over the falls. Some of these places aren’t too far from where I’m living now. HI-Ottawa Jail is quick drive down the highway to Ottawa and Kingston is about a three hour trip one way. The Haunted Walk sounds neat. Have you visited these spots or any other haunted places? Surprised to see the Blue ghost tunnel on this list!!! Just didn’t expect that. We visited it a couple years ago…..it IS pretty spooky!!! A great list, at least I now know where not to go! Have not visit any of the spots listed. A couple of years ago we did a ghost walk tour in downtown St. John’s with the grandchildren. The haunted walk does sound like fun. I’m curious about the tree too. I’d go try it for sure. I stayed in a haunted hotel for a week once in Chattanooga, Tennessee, The story is that it was used as a hospital during the Civil War and many ghosts appear throughout the multi-story hotel. Although, nothing strange happened while I was there, it was still a bit creepy. I am from Saskatoon and have never heard of the Lester B. Person School story – I will have to ask around and see if anyone else has heard (and I’m the only one missing out?). I have never been to these places, however, have been to The Grand Theatre in London which is said to be haunted by Ambrose Small. I have been to Queen’s Park and Hotel Fairmont and have never experienced anything “other worldly”… BUT, I do go to the Fairmont Banff Springs in Banff relatively often and did have an odd experience… There is a women’s bathroom on the second floor near the Cascade Ballroom which is reported to also have a ghost; I was taking a few moments to relieve myself during a wedding and was by myself (the bathroom is a little isolated – you would not know it was there unless you knew the hotel pretty well). Suddenly, the door was slammed open, heavy footsteps were heard on the tile floor and they stopped right in front of my stall… It was coldly silent. I peaked under the stall door to see if there were any shoes or legs and nothing. Of course, my heart was beating at like a ka-jillion miles an hour. And then suddenly there was a huge bang, like a gun being fired in close quarters. I jumped a mile in the air and screamed. I swear that if I had not been on the toilet already, I probably would have wet myself… LOL! I found out later that there is also a ghost story about a murder in this bathroom. I’ve never been back into that bathroom… I avoid it like the plague. LOLOL! just reading this list is already giving me the shivers! I have been to the Hotel Vancouver many times and it’s beautiful but definitely has a creepy vibe! The Marr Residence in Saskatoon is haunted, it was a camp for soldiers during the war in 1864. I got a got picture of a orb. I have a cottage near Buck Hill Road. That legend has been told to me since ’01. It’s near Round Lake, Ont.